Northern Pine Snake gallery photo by user orchidspider Northern Pine Snakes, Pituophis melanoleucus, have fascinated North American Snake Enthusiasts since before I was born and have been discussed with whispered breaths since my introduction to snakes at pet stores, shows, zoos, native wildlife agencies, universities, herp societies, internet groups, and every other facet of the snake world. Perhaps no locality or population garners more interest than the small and mostly isolated populations from Kentucky. No matter what population or locality, I have heard it said amongst the greatest minds on the subject that every single record for a specimen of Northern Pine Snake is note-worthy. I have been involved in research with this species in Kentucky for over 20 years and have been contacted with requests for DNA samples and any other data I can provide by those working on papers in efforts to publish updated information on every aspect of this snake’s biology throughout its range. 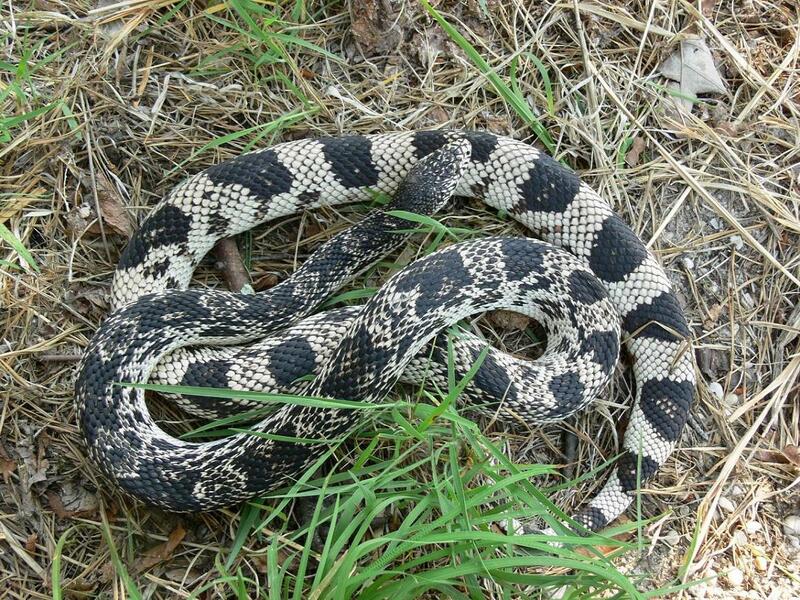 In 2006 my colleague Phil Peak and I were able to document the first live specimen of Northern Pine Snake recorded from the isolated Mammoth Cave Region population since 1969. None live or dead have been recorded since. In Spring of 2018 we found the cast skin pictured above under artificial cover we set out as part of a survey project we are involved in. The ability to recognize and identify a cast skin that many would have ignored or not given a second thought about is what led to our ability to formally record this as a confirmed observation backed by photograph. The passionate and extreme interest in this species from Kentucky’s limited and mostly isolated populations leads many interested parties to consider efforts to locate specimens. I offer a warning based on my decades of experiences. Be prepared and committed to make the ultimate sacrifices and resign yourself to pain and failure. After successful documentation of our Cave Region specimen I calculated the costs at being in excess of $15,000.00 which included the loss of a truck used in the process of survey. This does not include the hours of time spent or anything other than the money spent on gas, materials, etc. The discovery of the shed above cost in excess of $20,000.00 not including hours spent and other costs. Since producing this record I have been without my truck for over three weeks as the exploded engine only 6000 miles over warranty is being replaced. My wife is furious, my children see less of their father, my field partner is frustrated with the delays, and our survey efforts for 2018 have come to a halt. To those willing to go beyond the deli cups, choose a common species of snake that is readily found and for which ample data can be collected and studied. The nature of how the processes works for subjects such as this one are not for those who lack the willingness to put their interests in every other aspect of life to the grinding wheel as they look oblivion and desperation in the eye while refusing to blink as everything else they care about is lost and destroyed.